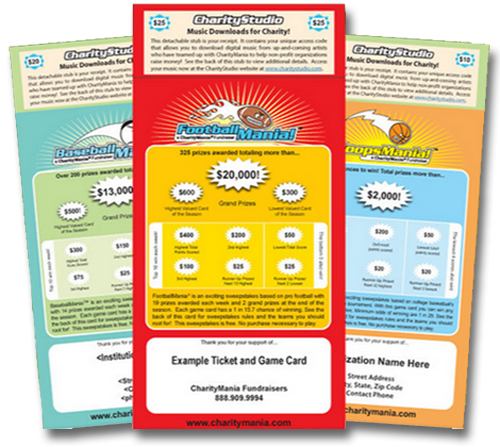 CharityMania’s Guaranteed Winners Program can make your fundraiser even more fun for your organization and more exciting for your game card holders! The program will ensure that your organization’s highest scoring game card will win a prize in each of the fundraiser’s contests. Use the following links to view the GWP details for each CharityMania fundraiser. CharityMania’s Guaranteed Winners Program can make FootballMania 17 Week even more fun for your organization and exciting for your game card holders! Each week the program will ensure that your organization has at least one winning game card… which means you are guaranteed to have at least 17 FootballMania winners from just your organization. In the past, your organization may have gone many weeks without having a winning game card, depending on the number of game cards you activated. With the Guaranteed Winners Program, if you don’t have a winner in any given week, then CharityMania will calculate a $25 bonus prize money winner just for your organization. The bonus prize money winner will be calculated based on your organization’s highest scoring game card for that week. This means that in each of the 17 weeks of the fundraiser, at least one of your activated game cards is guaranteed to win at least $25. Having a winner each week should be a great selling point when promoting the fundraiser to potential game card holders. Please note that the Guaranteed Winners Program is completely optional. For those organizations that opt into the program, they will be charged an additional fee for all tickets they activate as of the beginning of the fundraiser (i.e. the ticket activation deadline). This fee will cover a portion of the prize money that they will be paying out to their bonus prize money winners and CharityMania will be covering the remaining portion of that prize money. We also feel it is important to emphasize that CharityMania does not make any profit with this program… we share the cost of the additional prize money with you. The number of bonus prize money winners you have is largely dependent on the number of tickets you activate and so is the cost to participate in the program. The following is a guideline of the additional prices you will pay to participate. The actual fee is based on the number of tickets you activate. 999	game cards activated:	$5.87	total additional fee. 750	game cards activated:	$18.75	total additional fee. 500	game cards activated:	$56.22	total additional fee. 450	game cards activated:	$69.52	total additional fee. 400	game cards activated:	$85.75	total additional fee. 350	game cards activated:	$105.54	total additional fee. 300	game cards activated:	$129.60	total additional fee. 250	game cards activated:	$158.80	total additional fee. 200	game cards activated:	$194.15	total additional fee. 175	game cards activated:	$214.51	total additional fee. 150	game cards activated:	$236.88	total additional fee. 125	game cards activated:	$261.45	total additional fee. 100	game cards activated:	$288.41	total additional fee. 75	game cards activated:	$318.00	total additional fee. 50	game cards activated:	$350.46	total additional fee. CharityMania’s Guaranteed Winners Program can make FootballMania 17 Week even more fun for your organization and exciting for your ticket holders! Each week the program will ensure that your organization has at least one winning ticket… which means you are guaranteed to have at least 17 FootballMania winners from just your organization. In the past, your organization may have gone many weeks without having a winning ticket, depending on the number of tickets you activated. With the Guaranteed Winners Program, if you don’t have a winner in any given week, then CharityMania will calculate a $25 bonus prize money winner just for your organization. The bonus prize money winner will be calculated based on your organization’s highest scoring ticket for that week. This means that in each of the 17 weeks of the fundraiser, at least one of your activated tickets is guaranteed to win at least $25. Having a winner each week should be a great selling point when promoting the fundraiser to potential ticket holders. 2000	game cards activated:	$0.04	total additional fee. 1750	game cards activated:	$0.17	total additional fee. 1500	game cards activated:	$0.64	total additional fee. 1250	game cards activated:	$2.26	total additional fee. 1000	game cards activated:	$7.33	total additional fee. 750	game cards activated:	$22.10	total additional fee. 500	game cards activated:	$62.55	total additional fee. 450	game cards activated:	$76.48	total additional fee. 400	game cards activated:	$93.31	total additional fee. 350	game cards activated:	$113.58	total additional fee. 300	game cards activated:	$137.98	total additional fee. 250	game cards activated:	$167.26	total additional fee. 200	game cards activated:	$202.34	total additional fee. 175	game cards activated:	$222.38	total additional fee. 150	game cards activated:	$244.29	total additional fee. 125	game cards activated:	$268.23	total additional fee. 100	game cards activated:	$294.37	total additional fee. 75	game cards activated:	$322.91	total additional fee. 50	game cards activated:	$354.04	total additional fee. CharityMania’s Guaranteed Winners Program can make FootballMania 10 Week even more fun for your organization and exciting for your game card holders! Each week the program will ensure that your organization has at least one winning game card… which means you are guaranteed to have at least 10 FootballMania winners from just your organization. In the past, organizations that did not sell many game cards may have had weeks where none of their game cards won a prize. With the Guaranteed Winners Program, if you don’t have a winner in any given week, then CharityMania will calculate a $25 bonus prize money winner just for your organization. The bonus prize money winner will be calculated based on your organization’s highest scoring game card for that week. This means that in each of the 10 weeks of the fundraiser, at least one of your activated game cards is guaranteed to win at least $25. Having a winner each week should be a great selling point when promoting the fundraiser to potential game card holders. The cost to participate in the program is dependent on the number of tickets you activate. Organizations that activate 300 tickets or more are automatically enrolled into the program! For those orgs that activate fewer than 300 tickets, the guideline below outlines the additional cost if you participate in the program. The actual fee is based on the exact number of tickets activated. 299	game cards activated:	$38.50	total additional fee. 275	game cards activated:	$44.93	total additional fee. 250	game cards activated:	$52.73	total additional fee. 225	game cards activated:	$61.84	total additional fee. 200	game cards activated:	$72.46	total additional fee. 175	game cards activated:	$84.83	total additional fee. 150	game cards activated:	$99.23	total additional fee. 125	game cards activated:	$115.98	total additional fee. 100	game cards activated:	$135.45	total additional fee. 75	game cards activated:	$158.07	total additional fee. 50	game cards activated:	$184.31	total additional fee. In the past, organizations that did not sell many game cards may have had weeks where none of their game cards won a prize. With the Guaranteed Winners Program, if you don’t have a winner in any given week, then CharityMania will calculate a $10 bonus prize money winner just for your organization. The bonus prize money winner will be calculated based on your organization’s highest scoring game card for that week. This means that in each of the 10 weeks of the fundraiser, at least one of your activated game cards is guaranteed to win at least $10. Having a winner each week should be a great selling point when promoting the fundraiser to potential game card holders. 299	game cards activated:	$15.40	total additional fee. 275	game cards activated:	$17.97	total additional fee. 250	game cards activated:	$21.09	total additional fee. 225	game cards activated:	$24.74	total additional fee. 200	game cards activated:	$28.98	total additional fee. 175	game cards activated:	$33.93	total additional fee. 150	game cards activated:	$39.69	total additional fee. 125	game cards activated:	$46.39	total additional fee. 100	game cards activated:	$54.18	total additional fee. 75	game cards activated:	$63.23	total additional fee. 50	game cards activated:	$73.72	total additional fee. CharityMania’s Guaranteed Winners Program can make FootballMania 5 Week even more fun for your organization and exciting for your game card holders! Each week the program will ensure that your organization has at least one winning game card… which means you are guaranteed to have at least 5 FootballMania winners from just your organization. In the past, organizations that did not sell many game cards may have had weeks where none of their game cards won a prize. With the Guaranteed Winners Program, if you don’t have a winner in any given week, then CharityMania will calculate a $10 bonus prize money winner just for your organization. The bonus prize money winner will be calculated based on your organization’s highest scoring game card for that week. This means that in each of the 5 weeks of the fundraiser, at least one of your activated game cards is guaranteed to win at least $10. Having a winner each week should be a great selling point when promoting the fundraiser to potential game card holders. The cost to participate in the program is dependent on the number of tickets you activate. Organizations that activate 150 tickets or more are automatically enrolled into the program! For those orgs that activate fewer than 150 tickets, the guideline below outlines the additional cost if you participate in the program. The actual fee is based on the exact number of tickets activated. 149 game cards activated:	$5.82	total additional fee. 125 game cards activated:	$8.27	total additional fee. 100 game cards activated:	$11.90	total additional fee. 75 game cards activated:	$17.08	total additional fee. 50 game cards activated:	$24.48	total additional fee. CharityMania’s Guaranteed Winners Program can make FootballMania College Edition even more fun for your organization and exciting for your game card holders! Each week the program will ensure that your organization has at least one winning game card… which means you are guaranteed to have at least 10 FootballMania winners from just your organization. In the past, organizations that did not sell many tickets may have had weeks where none of their game cards won a prize. With the Guaranteed Winners Program, if you don’t have a winner in any given week, then CharityMania will calculate a $10 bonus prize money winner just for your organization. The bonus prize money winner will be calculated based on your organization’s highest scoring game card for that week. This means that in each of the 10 weeks of the fundraiser, at least one of your activated game cards is guaranteed to win at least $10. Having a winner each week should be a great selling point when promoting the fundraiser to potential game card holders. We’re sorry but the FootballMania SuperMatch fundraiser does not have a Guaranteed Winners Program. With odds of winning at 1 in 14 per game card, we’re confident you’ll have plenty of prize winners during this fundraiser. Good luck! We are excited to offer the Guaranteed Winner Program that should make HoopsMania even more fun for your organization and exciting for your game card holders! The program ensures your organization has at least 1 winning game card from among just your game card holders. We have run this program now for all of our major fundraisers and it has been a great success. Not only has the program made the fundraisers more exciting for the game card holders, but it has been a great selling point for organizations when they promote the fundraiser to potential ticket buyers. In the past, your organization may not have had a winning HoopsMania game card simply due to the number of game cards you activated and the luck of the draw. With the Guaranteed Winners Program, CharityMania will ensure that your organization has at least 1 winner, no matter how many game cards you activate. If none of the game cards your organization activates are in the top 70 or bottom 5 scores, then a $10 “Bonus Prize” will be awarded to your organization’s highest scoring game card. If one of your game cards is already a grand prize or runner-up winner, then no Bonus Prize is awarded. 29	game cards activated:	$5.00	total additional fee. 25	game cards activated:	$5.00	total additional fee. In the past, your organization may not have had a winning HoopsMania game card simply due to the number of game card you activated and the luck of the draw. With the Guaranteed Winners Program, CharityMania will ensure that your organization has at least 1 winner, no matter how many game cards you activate. If none of the game cards your organization activates are in the top 70 or bottom 5 scores, then a $20 “Bonus Prize” will be awarded to your organization’s highest scoring game card. If one of your game cards is already a grand prize or runner-up winner, then no Bonus Prize is awarded. 29	game cards activated:	$10.00	total additional fee. 25	game cards activated:	$10.00	total additional fee. In the past, your organization may not have had a winning HoopsMania game card simply due to the number of game card you activated and the luck of the draw. With the Guaranteed Winners Program, CharityMania will ensure that your organization has at least 1 winner, no matter how many game cards you activate. If none of the game cards your organization activates are in the top 70 or bottom 5 scores, then a $30 “Bonus Prize” will be awarded to your organization’s highest scoring game card. If one of your game cards is already a grand prize or runner-up winner, then no Bonus Prize is awarded. CharityMania’s Guaranteed Winners Program can make BaseballMania even more fun for your organization and exciting for your game card holders! Each week the program will ensure that your organization has at least one winning game card… which means you are guaranteed to have at least 10 BaseballMania winners from just your organization. In the past, your organization may have gone many weeks without having a winning game card, depending on the number of game cards you activated. With the Guaranteed Winners Program, if you don’t have a winner in any given week, then CharityMania will calculate a $10 bonus prize money winner just for your organization. The bonus prize money winner will be calculated based on your organization’s highest scoring game card for that week. This means that in each of the 10 weeks of the fundraiser, at least one of your activated game cards is guaranteed to win at least $10. Having a winner each week should be a great selling point when promoting the fundraiser to potential game card holders. 750	game cards activated:	$0.90	total additional fee. 500	game cards activated:	$4.82	total additional fee. 450	game cards activated:	$6.66	total additional fee. 400	game cards activated:	$9.14	total additional fee. 350	game cards activated:	$12.50	total additional fee. 300	game cards activated:	$17.02	total additional fee. 250	game cards activated:	$23.09	total additional fee. 200	game cards activated:	$31.19	total additional fee. 175	game cards activated:	$36.20	total additional fee. 150	game cards activated:	$41.97	total additional fee. 125	game cards activated:	$48.61	total additional fee. 100	game cards activated:	$56.26	total additional fee. 75	game cards activated:	$65.05	total additional fee. 50	game cards activated:	$75.14	total additional fee. In the past, your organization may have gone many weeks without having a winning game card, depending on the number of game cards you activated. With the Guaranteed Winners Program, if you don’t have a winner in any given week, then CharityMania will calculate a $25 bonus prize money winner just for your organization. The bonus prize money winner will be calculated based on your organization’s highest scoring game card for that week. This means that in each of the 10 weeks of the fundraiser, at least one of your activated game cards is guaranteed to win at least $25. Having a winner each week should be a great selling point when promoting the fundraiser to potential game card holders. 750	game cards activated:	$2.25	total additional fee. 500	game cards activated:	$12.06	total additional fee. 450	game cards activated:	$16.64	total additional fee. 400	game cards activated:	$22.85	total additional fee. 350	game cards activated:	$31.25	total additional fee. 300	game cards activated:	$42.56	total additional fee. 250	game cards activated:	$57.72	total additional fee. 200	game cards activated:	$77.97	total additional fee. 175	game cards activated:	$90.49	total additional fee. 150	game cards activated:	$104.92	total additional fee. 125	game cards activated:	$121.54	total additional fee. 100	game cards activated:	$140.65	total additional fee. 75	game cards activated:	$162.62	total additional fee. 50	game cards activated:	$187.86	total additional fee. CharityMania’s Guaranteed Winners Program can make HockeyMania even more fun for your organization and exciting for your game card holders! Each week the program will ensure that your organization has at least one winning game card… which means you are guaranteed to have at least 15 HockeyMania winners from just your organization. In the past, your organization may have gone many weeks without having a winning game card, depending on the number of game cards you activated. With the Guaranteed Winners Program, if you don’t have a winner in any given week, then CharityMania will calculate a $20 bonus prize money winner just for your organization. The bonus prize money winner will be calculated based on your organization’s highest scoring game card for that week. This means that in each of the 15 weeks of the fundraiser, at least one of your activated game cards is guaranteed to win at least $25. Having a winner each week should be a great selling point when promoting the fundraiser to potential game card holders. 999	game cards activated:	$7.14	total additional fee. 750	game cards activated:	$21.38	total additional fee. 500	game cards activated:	$59.37	total additional fee. 450	game cards activated:	$72.20	total additional fee. 400	game cards activated:	$87.57	total additional fee. 350	game cards activated:	$105.92	total additional fee. 300	game cards activated:	$127.80	total additional fee. 250	game cards activated:	$153.81	total additional fee. 200	game cards activated:	$184.66	total additional fee. 175	game cards activated:	$202.16	total additional fee. 150	game cards activated:	$221.19	total additional fee. 125	game cards activated:	$241.87	total additional fee. 100	game cards activated:	$264.33	total additional fee. 75	game cards activated:	$288.72	total additional fee. 50	game cards activated:	$315.19	total additional fee. The Guaranteed Winners Program makes GolfMania even more fun for your organization and exciting for your game card holders! The program ensures your organization has at least 1 winning game card in each golf tournament during the GolfMania fundraiser. We have run this program now for all of our major fundraisers and it has been a great success. Not only has the program made the fundraisers more exciting for the game card holders, but it has been a great selling point for organizations when they promote the fundraiser to potential game card holders. In the past, your organization may not have had a winning GolfMania game card simply due to the number of game cards you activated and the luck of the draw. With the Guaranteed Winners Program, CharityMania will ensure that your organization has at least one winner in each of the four GolfMania contests. In each contest, if your organization does not already have a winning game card, then a $20 “Bonus Prize” will be awarded to your organization’s lowest scoring game card. 299	game cards activated:	$1.77	total additional fee. 250	game cards activated:	$3.54	total additional fee. 200	game cards activated:	$7.10	total additional fee. 175	game cards activated:	$9.99	total additional fee. 150	game cards activated:	$14.02	total additional fee. 125	game cards activated:	$19.61	total additional fee. 100	game cards activated:	$27.33	total additional fee. 75	game cards activated:	$37.98	total additional fee. 50	game cards activated:	$52.60	total additional fee. In the past, your organization may not have had a winning GolfMania game card simply due to the number of game cards you activated and the luck of the draw. With the Guaranteed Winners Program, CharityMania will ensure that your organization has at least one best-score winner in each of the four GolfMania contests. In each contest, if your organization does not already have a best-score winning game card, then a $20 “Bonus Prize” will be awarded to your organization’s lowest scoring game card.